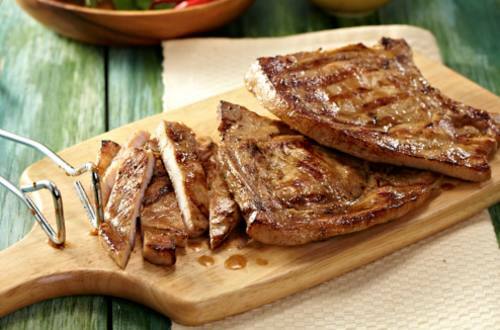 1 To bring out the best flavour out of pork chops, carefully place the meat in a ziplock or a heavy duty food-grade plastic bag. Add in the Knorr Liquid Seasoning, black pepper, and herbs. Make sure the plastic bag where you put the meat in is compressed and sealed like a vacuum to remove the air bubbles. Massage the meat in the plastic bag and watch as it begins to become fully coated with the ingredients you’ve mixed in. This technique allows you to save on the amount of marinade and also saves storage space. 2 Now, you can preheat your grill pan. Ordinary pans will not do, unfortunately. Brush the pan’s surface gently with a little bit of oil to help prevent the meat from sticking to the pan. Then, lay the meat slice on the pan. Cook for 2 to 3 minutes per side or until the meat is firm in the center. In pan-grilling your meat, make sure that the pan you’re using has a heavy bottom base. If your pan is too thin, your meat will burn easily. 3 That’s it! So simple and oh so delicious! You may also serve this with a dipping sauce of Knorr Liquid Seasoning, vinegar, diced white onions and chopped chilli. And don’t forget the rice!